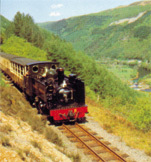 On Wednesday, 9 April 2003, an excursion has been arranged to the town of Devil's Bridge on the narrow guage Rheidol Steam Railway. We will be leaving the University at 5.00pm and taking the train from Aberystwyth station to Devil's Bridge. This journey will take approximately 1 hour, providing magnificent views of the countryside surrounding Aberystwyth. On arrival in Devil's Bridge you will have an opportunity to explore the waterfalls; please wear sturdy, comfortable footwear. After exploring the falls there will be a delicious buffet with wine at the Hafod Arms Hotel in Devils Bridge, which will include traditional Welsh food. We will return to Aberystywth by coach. For further information about the Vale of Rheidol Railway please visit www.rheidolrailway.co.uk; and for information about the Hafod Arms please visit www.hafodarms.co.uk. This excursion is not to be missed !